In many cases, a below-slab perimeter drain leading to a sump pit with at least two pumps (primary and backup) is the answer. 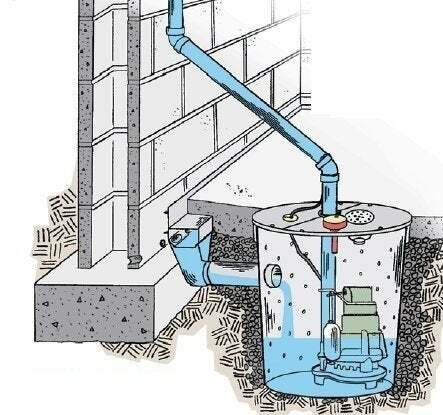 The sump pit should be installed in the lowest part of the room perimeter and set-up to discharge water outside in the most efficient manner. Many finished basements build a closet around the sump pit. Regardless of how you conceal it, be sure to allow for easy access. Groundwater isn’t the only source of dampness and moisture in a basement. Plumbing leaks and condensation are two other common sources. A good waterproofing contractor can install water alerts in your laundry area and near water heater tanks to warn you of a leak before it can cause major damage. He can also recommend a self-draining, high-capacity dehumidifier to further remedy moisture issues. When finishing a basement, it’s smart to use materials that can stand up to water and moisture. Conventional materials like drywall, wood framing, and MDF moldings are not necessarily the best choices in below-grade applications. That’s why several companies offer complete basement finishing systems that include waterproof wall panels, moisture-proof drop ceilings, mold-proof PVC moldings and water-resistant underfloor systems; everything to reduce the risk from water damage. Owens Corning offers an insulated wall panel for basement conversion composed of compressed fiberglass lined by vinyl on the finished side. It attaches to block and poured concrete foundation walls with special channels. If you need access to electrical wires or plumbing behind the panels, you can remove them. The panels are non-flammable, impact resistant, won’t trap water vapor, and don’t support mold. They may, however, be damaged in a flood if left standing in water for any length of time. Total Basement Finishing (TBF), a Basement Systems, Inc. company, offers a highly impact-resistant cement panel backed by rigid foam insulation. It’s strong enough to support anything you’d hang on a conventionally framed wall. Precut channels make wiring easy. And a linen-look vinyl skin in white and beige covers the finished side. TBF panels can be installed in floor and ceiling tracks independent of the foundation wall, or they can be attached directly to foundation walls. The system is versatile enough that you can leave a portion of your basement unfinished, or divide the space into rooms, or even erect closets. In addition to various versions of its wall panels, TBF offers a menu of other basement remodeling products, including finished stair kits, drop ceilings, and waterproof flooring. The parent company, Basement Systems, is a nationwide network of waterproofing contractors, so it’s likely that the TBF dealer in your area will be able to help with basement waterproofing, too. Do-it-yourselfers looking to save some money will want to consider basement wall panels made of magnesium oxide, like those from Wahoo Walls. When adhered to polystyrene insulation, MgO boards insulate to R-11. They are well-suited to damp areas, are mold- and mildew-resistant, and are easy to cut and install. Plus, they can be painted. The boards install in L-shaped steel brackets screwed to the slab and joists, which have pre-cut wiring and cable channels. Panels for interior partitions are also available without the insulation. The company offers excellent installation instructions. Unless you’re fortunate enough to have a walkout basement, where one or more walls are above-grade and can accommodate large windows and glazed doors, natural lighting is going to be limited in your basement to a handful of small windows. Fortunately, dropped or suspended ceilings, common in basements, can easily and attractively accommodate recessed can, track, and fluorescent troffer fixtures. Designers recommend lots of perimeter lighting as well, including sconces, recessed spotlights, and fluorescent tubes or LED wall washers hidden behind coves. By lighting the walls, you can simulate natural ambient light and make the space seem bigger. Accommodating ductwork and beams is often a challenge. Painting them to match the ceiling is a common approach. Another is to paint them in bright playful colors. So is boxing the ducts in with soffits, or wood-framed enclosures covered with drywall or MDF. Keep in mind, however, that duct enclosures cannot extend more than 6 inches below the minimum 7-ft. allowable ceiling height. If there are ducts that are hanging too low, sometimes they can be split into smaller ducts. Wider and flatter replacement ducts can also be installed to gain a few inches of headroom. Whatever you do, check with your local building department before beginning work to be sure your plan conforms to building codes. Basement bathrooms, laundries, and kitchens, common features in many conversions, are straightforward with regard to hot and cold water supply lines, though not always for drainage. 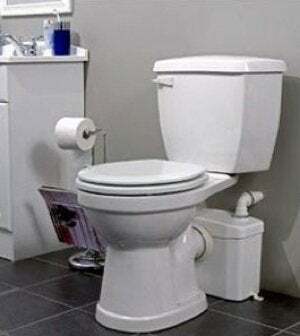 If necessary, there are several methods for draining sewage waste and wastewater—especially from toilets—upwards to existing drain lines. The least expensive is a macerating bathroom pump, like those by Saniflo. It turns on automatically to pump toilet waste and grey water from sink, shower, tub or laundry to your sewer line. These units are compact and quiet, typically fitting either directly behind the toilet or behind the wall. Basement rooms can be used for many purposes: laundry, home theater, game playing, hobbies and crafts, and the list goes on. There are many building codes intended to ensure the safety of occupants that apply to all of the above. They include the use of smoke and CO detectors, GFI receptacles, outside combustion air for the furnace or boiler, materials that resist the spread of fire, minimum room sizes, and emergency window well egress. When choosing contractors to work on your basement conversion, find one who has done the job many times before and who is knowledgeable about applicable codes. Do not work with a contractor who says you can convert a basement without pulling permits.